This may look like a typical Bluetooth speaker, but it has a feature-list much longer than usual. To start with, it has the things you would expect: Bluetooth v3.0, AUX input, FM radio, a full size USB port (for USB drives) and a microSD card — that’s five ways to play music right there! It also has NFC for easy pairing and a USB charging port (5V, 1 Amp output). But the S-50 also has an LED display — like old clock radios. It can be your bedside/desktop clock and alarm, w .. It can be your bedside/desktop clock and alarm, waking you up with your audio of choice. 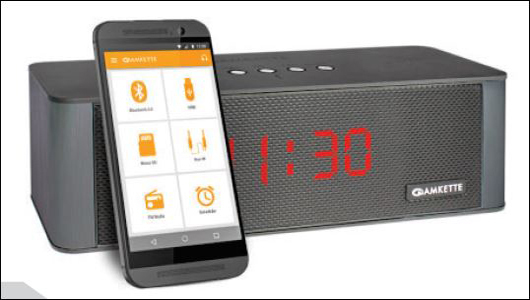 Finally, this is also one of the first appcontrolled Bluetooth speakers: with the Android app, you can control the radio, alarm clock and USB/micro SD music playback. Battery life varies from 12 to 15 hours on a charge. As for the sound itself, it has two 5 watt speakers and a passive subwoofer — while the sound is good at low to mid volumes, we would still rate the similarly priced JBL Flip 2 higher for sound quality.